Welcome to the 2014 Carnival of Evolution World Cup of evolution blog posts. We have an exciting post ahead of us today where we will find the winner of the inaugural CoE World Cup. Entered posts will be scored based on several parameters, and matches will be determined probabilistically. +1 for mentioning "evolution" or "evolve"
-1 for saying "develop" or "development" when meaning "evolve" or "evolution"
On guenon monkeys using facial recognition to prevent inbreeding. On spiders hiding from predators by looking like bird poop. On Twitter data from the 2014 Evolution conference. The molecular ecologist. Jeremy Yoder. The remaining 16 posts were paired up at random and the winner of each match determined randomly, with the probability of winning given by the score. For example, two scores of 10 and 15 will give the posts 40% and 60% chances of winning, respectively. 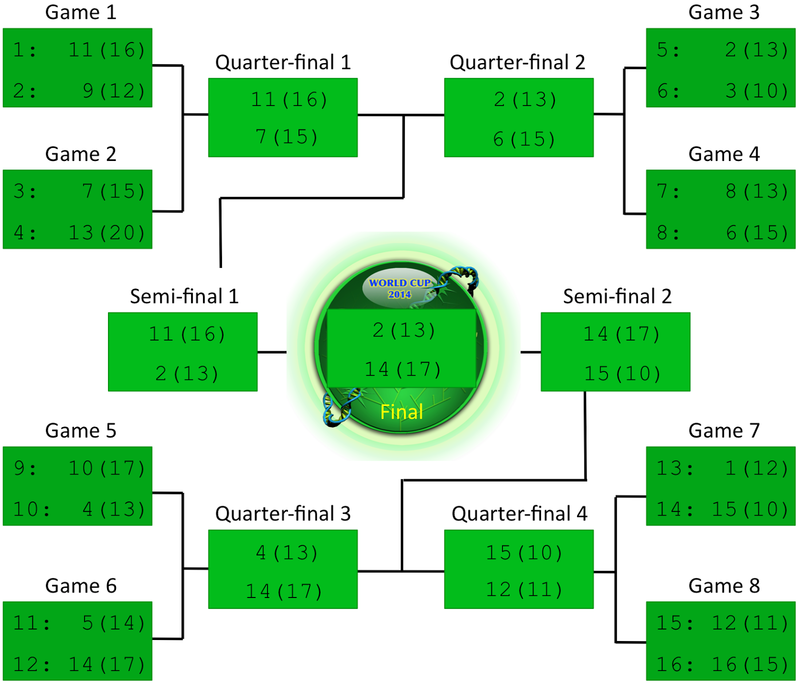 The following list of the remaining 16 posts have three numbers each: their ID number, their score, and their randomly assigned spot in the round of 16. On conus snail venom and how they are administered. On, well, Wright's Shifting Balance Theory. Evolution in Structured Populations. Charles Goodnight. On a fossil of an aquatic fly larva from the Chinese mid-Jurassic. On the computational details behind the simulations. On the genetic and genomic changes that underlie adaptation to divergent environments. On the biology of the models behind the video. On the probability of convergent evolution. On the distribution of topics at the 2014 Evolution conference. A great tree. Lewis Spurgin. And that concludes the round of 16. Some surprises along the way so far. The least likely post to win actually won in 3 out of 8 games, and we had to say goodbye to two of the overall favorites, Wright's Shifting Balance Process and Add it up: the genetic basis of ecological adaptation. On the probability to leave descendants based on trees contracted from nucleotide sequences. On whether humans skulls evolved in response to taking a lot of punches. On measuring mutation rate and mutational effects in yeast. The molecular ecologist. Ryosuke Kit. On the role of genetic drift in Wright's Shifting Balance Theory. That concludes the quarter-finals. We'll take a short break before we begin the semi-finals. On genetic drift and epistasis. On what science can and cannot comment on. it is NOT junk. Michael Eisen. We are thus left with just two posts for the final match that will decide who wins the 2014 Carnival of Evolution World Cup. It is The Function Wars: Part I (score = 13, P = 43.3%) versus Of Population Structure and the Adaptive Landscapes (score = 17, P = 56.7%). Both posts have played really well so far, surviving some really close calls. Both posts have a lot to offer on evolution, though one is severely disadvantaged by its excessive length. Can The Function Wars: Part I overcome this obstacle today, or will Of Population Structure and the Adaptive Landscapes prevail as most people expect? On ENCODE and the definitions of function. Congratulations to the post from Sandwalk and to writer Larry Moran!!! 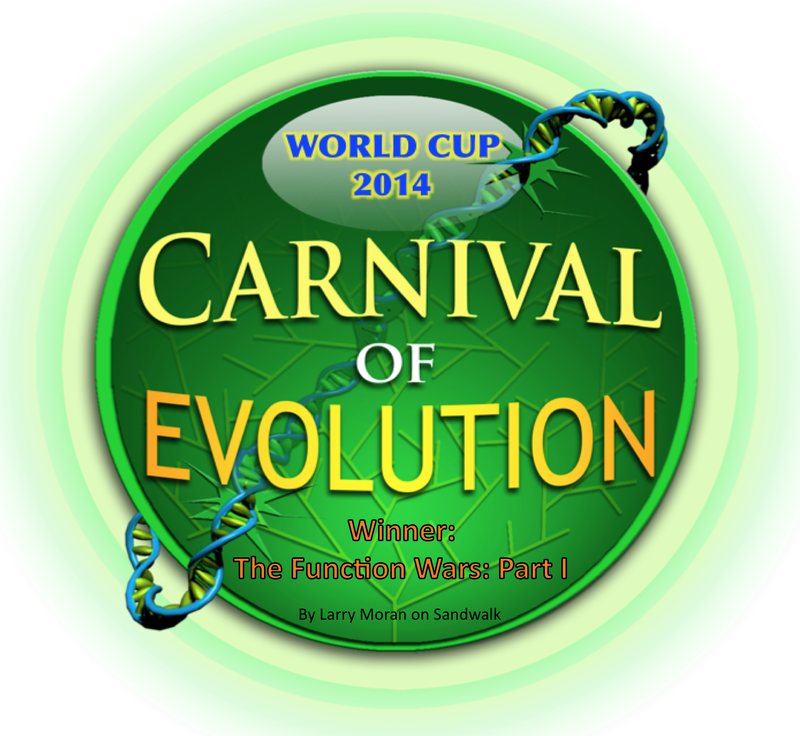 That concludes the inaugural Carnival of Evolution World Cup 2014. Come back next month for more blogging about evolution. We still don't have a host, so if you're interested please contact the administrator by email, Facebook, or Twitter. You can submit posts via all three of those as well. I can't imagine losing to a better opponent. Well played Larry Moran and Sandwalk. I do love your blog.